Ein erstes Layout für dieses Jahr – von unserem Treffen im Dezember- es war echt so schön. Und das Foto erinnert mich, dass ich so viele wunderbare Menschen durch das Scrappen kennengelernt habe. A first layout for this year – it is about our meeting in December with was really cool. 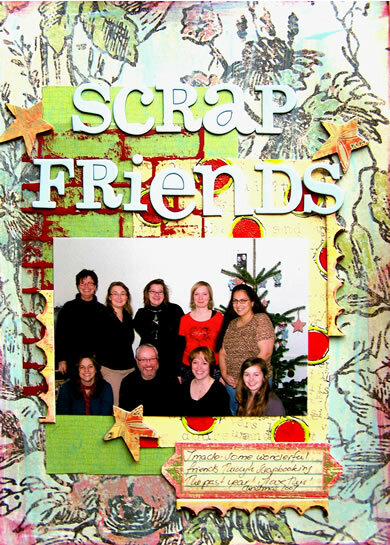 And the photo reminds me that I got to know so many wonderful persons through Scrapbooking. Supplies: Prima IOD Papers and Chipboard, Hambly Overlay Cosmo Cricket Chipboard and Paper, Heidi Swapp Chipboard Letters. Painted the Prima Paper with a acrylic glaze in blue. Used some Prima leftover negative chipboard as borders. und ich kann mich dir und den anderen ebenfalls nur anschlieÃƒÆ’Ã…Â¸en: ich bin froh, das es euch gibts!! great layout!! hugs hugs! !